When visiting the southwest, taking time to enjoy the landscape is a must. 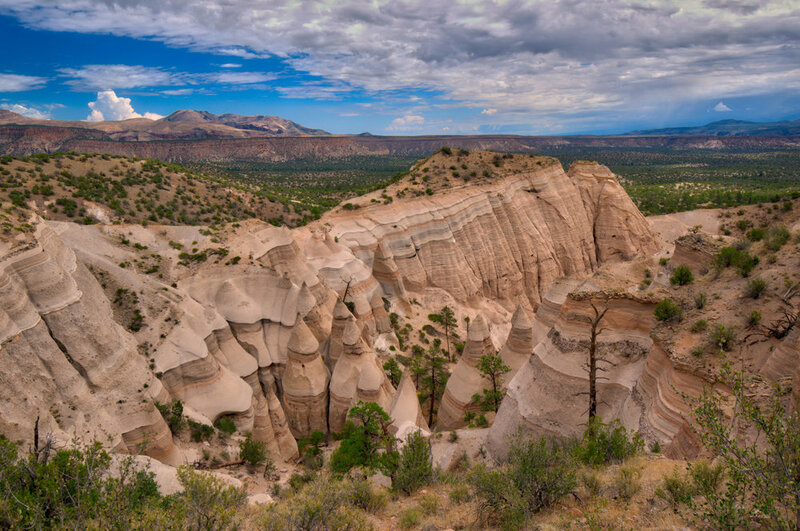 One of the best places for this within an easy drive of Santa Fe is Tent Rocks National Monument. I’ve done the hike there a few times now, but I’ll always keep asking to go back because of the unique rock formations and the stunning views. The trail starts by going through a narrow slot canyon, leads you up a steep climb, and then lets out along a long ridge. The climb up is the most difficult part, and if you aren’t a sure-footed person or don’t like scrambling over rocks as opposed to a standard trail hike, this may not be for you. However, visiting the slot canyon is an amazing trip by itself (and flat! ), so I would recommend that to anyone, regardless of hiking level. The view from the top is something else. I always have to take a picture for mom to remind her why she should come enjoy the view at the edge... but she hates the drop. She gets a little bit closer every time though, and one day she will fully conquer the ridge!